Once again the USGA has made a costly mistake. By scheduling the U.S. Women’s Open in North Carolina in the summer that have brought the inevitable weather delay into play for virtually every round. The southeast is the hot, unbearably humid, dangerous thunderstorm capital of the U.S. If you really want to sweat (or glow) like a little piggy when you play a round of golf, go play there in the summer. So now the USGA is stuck in the middle of round two. Half of the field has not even teed it up for its nineteenth hole and the majority has not finished 36 holes. It has now become a logistical nightmare to finish this tournament on Sunday assuming there are no more weather delays. But the solution is simple. Hold the event here in southern Arizona in late June. There are a myriad of reasons why So. AZ is a better choice than some tree-lined, Donald Ross-designed course in the middle of one of the self-appointed golf capitals of the world. The weather will be no problem. We can almost guarantee all day sunshine with the temperature about 110 degrees with virtually no humidity. There will be no need for evacuation vans in the event of thunder and lightening. Parking will be no problem for the few hundred spectators and staff. There are hundreds of acres of desert. 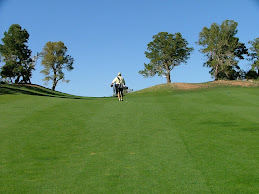 The players won’t have to put up with all those damned pine trees that tend to reach out a grab a golf ball. And there’ll none of that ultra-thick, made-for-hay bluegrass rough that’s ill advised for the limp-wristed. Yes, and I have no doubt there are a multitude more valid reasons for AZ and the place. Just add your own.